Firstly, let me say this: Yes, Yamato is my first Tier 10, she's also been my goal in this game since I started WAY back in the Closed Beta Test. No, I do not care if GK is better, I do not care if Conqueror is a better damage dealer, and I certainly do not care for Montana. The one ship that has managed to stay very consistent in her stats, and her place on the server despite the power-creep and all the other Tier 10 BBs either being buffed or coming out with waterline citadels, is the Yamato. I went for her because I fell in love with her design 12 years ago. She's consistently been my favorite Battleship since then, and I've fallen in love all over again with her. The very reason I fell for her was because of how beautiful her silhouette looks. She's the only Battleship out there that looks like this, with a very unique downward deck curve meant to strengthen the hull during rough seas and hard maneuvers as well as save a lot of weight. Now that I finally have her, I can have a new goal. I welcomed her to my port yesterday morning. And she's been fun since. 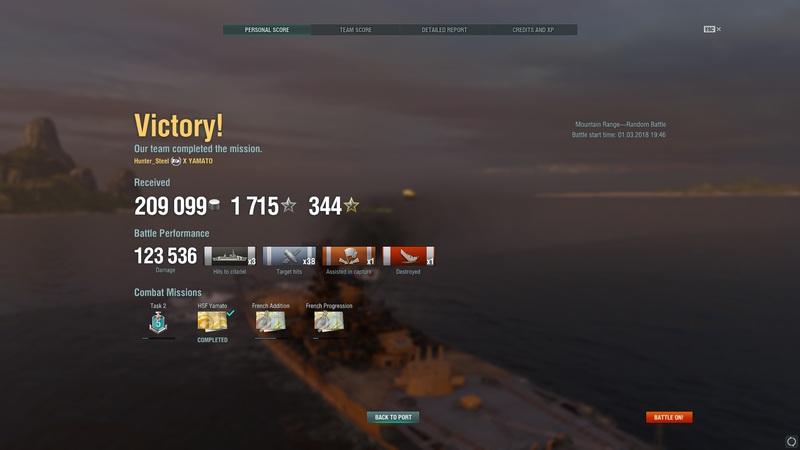 After a few rough start battles, my Yamato is finally clicking with me. Damage numbers are becoming more consistent, and my aim has improved considerably. The biggest thing I can say that I love about her is that I pretty much never need to change shells. Her AP rounds penetrate everything, rarely shatter and even overmatch most Tier 10 BB decks. I have no issues shooting the deck of an angled target and I very much do enjoy shooting at people's bows. She's an experience that Izumo (Which I also did love.) never was. Everything that a player learns from the other 6 tiers, comes together into Yamato. 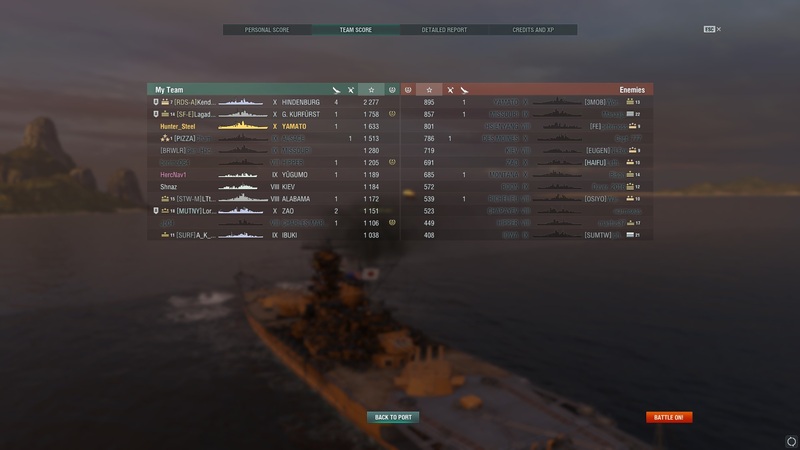 The accuracy and power one feels in Nagato, the soft hull of Kongou, Fusou, Nagato and Amagi, the angling lessons learned in those four ships, the timing learned for timing salvos when trading, the clumsiness of Izumo, kiting enemies in Myogi, Kongou and Amagi, long range sniping and the most important of all, fun factor. (Except Fusou, I hated her, and Kawachi.) Kongou, Nagato, Amagi and Izumo. These four were very much fun to sail, and very nice to work with. 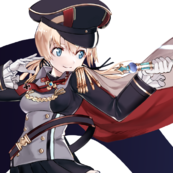 And all these things come together, all those experiences, so that you may enjoy the Queen of Battleships, and who to me, is still the Queen of Tier 10. Consistency is a great thing, and now that I am finally getting the hang of her, she's starting to sing. 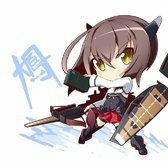 Her 460mm guns give pain to anyone foolish enough to forget the might of Yamato, and her belt deters all but biggest of guns. Congrats Hunter! I got Yamato a couple months ago myself, and she is a blast to play. She has my highest damage record to date and is just an experience you don't get anywhere else. Hood job getting Yamato! I'm still trying to work on izumo. Speaking of which, do you have any advice for izumo? I sold her for ibuki because I found izumo to be really hard to use. 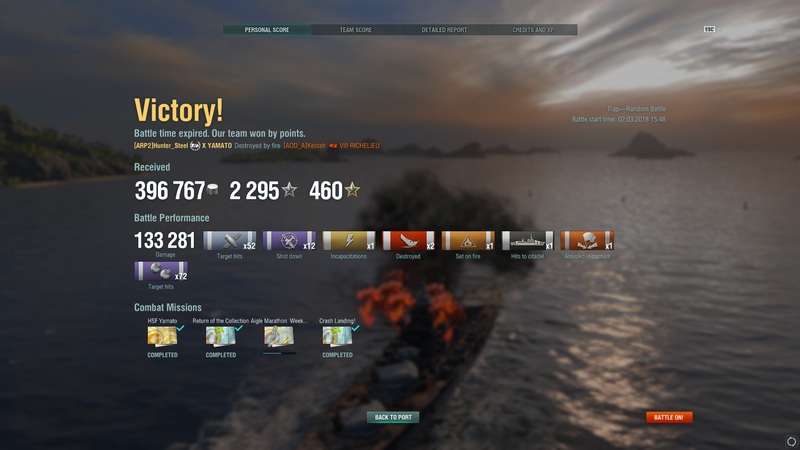 Like you, the Yamato was my first T10 target. Got her over a year ago, and must say I was disappointed. Don't get me wrong, she's a great ship. 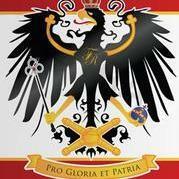 Takes a few battles to get used too of course and is fine. I was just, in my head, expecting this big OP monster. She's not that that. She may be strong,,, but she's also SOOO vulnerable. Torps, fire spammers etc. Been 1 on 1 with a DD near end of match. No contest. DD always wins. Faster, more maneuverable, smoke, HE spam and torps. Its my biggest complaint about this game and always has been. Grats on getting Yamato! What’s with the camo? Did you at least get the HSF camouflage for it? 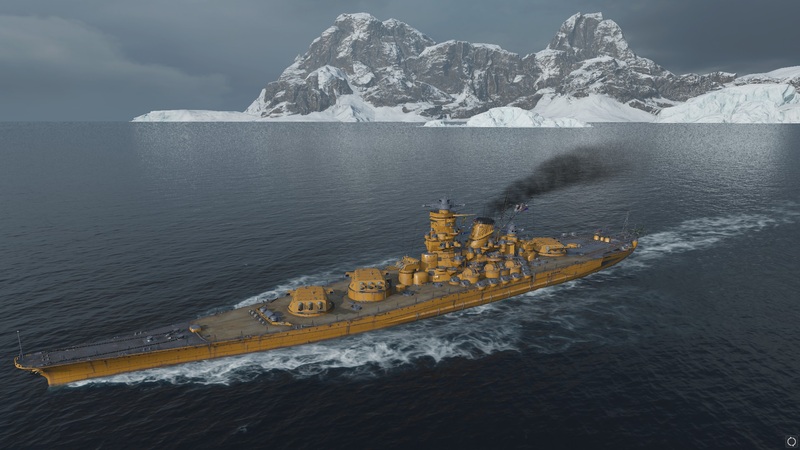 If you don’t plan to buy permanent camo for 5,000 doubloons, make sure to pick up HSF camo - it will help with service costs. Also, in the latest patch camo got an optional color scheme for it's permanent camouflage, you may like it. I got mine a couple of months ago and really enjoy her too. The lolpens (now matter how inconsistent), the laser accuracy, the sound effects for the guns... even the horn always keep me smiling. 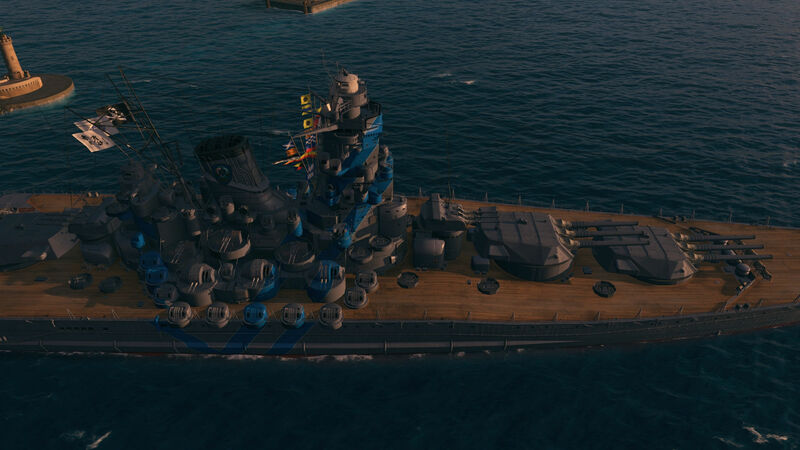 The biggest issue with Izumo is her turret placement, other than that, she's pretty fine IMO. Try to use her between the back and front lines as a mid-line support and move in to tank some damage if needed later in the match. There are no queue times on coop, it will make game in 30 seconds if you are the only one there, your team will be full of bots. Also the games are much faster than randoms, because bots never camp. I don’t normally play coop, but for some missions it’s really a big time saver. Yamato is strong but not OP, and people will absolutely go out of their way to get your guns out of the fight if they can. It's one of those things where you need to understand what your ship is and isn't good at. 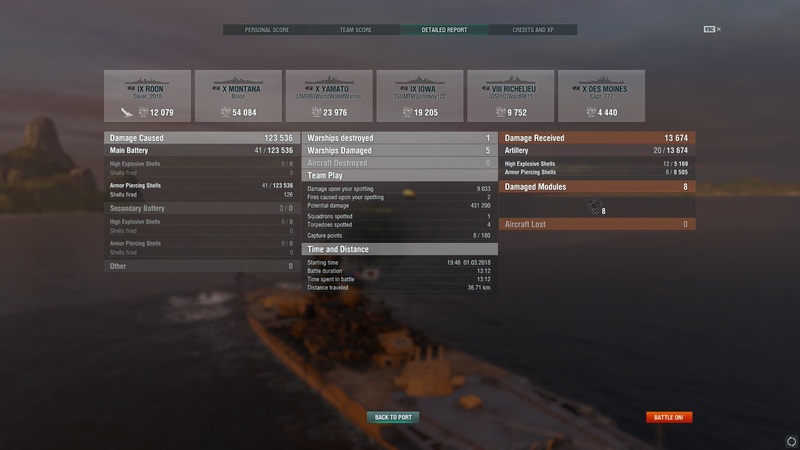 You have to be extremely patient with it because it's tanky angled or bow in with the right build, but if you get caught in crossfire or give up your broadside then there's not a lot of happy endings for you. Something I've also found is people will consciously angle against me and willingly give up broadsides to the rest of my team to avoid giving me good shots, which is useful for said team but also annoying for me. Despite the harangues from those who insist that BB's play more upfront, you'd be wise not to in the Yammy. 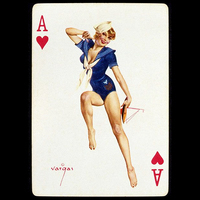 As stated, she's so vulnerable to cruiser HE and torps. 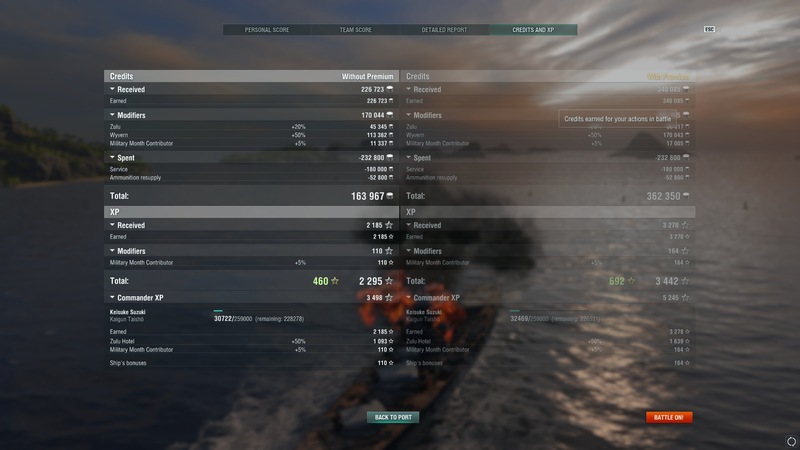 But with those rifles, you can hit bow on cruisers at 22 km no problem, something the dispersion of other BB's makes more difficult. She can dominate the battlefield from the middle. You just can't be caught on the flanks and pinned, or overextend yourself. 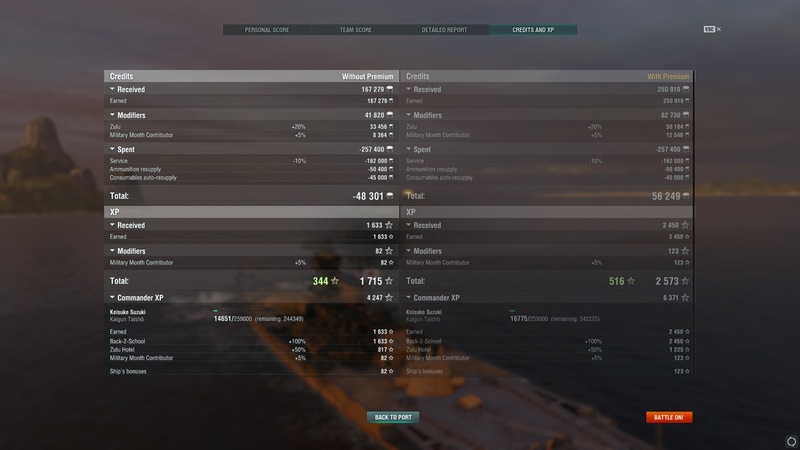 And yes, seems that most IJN and USN ships of all types have suffered from power creep, except the mighty Yamato. I just got her a month or so ago, and free XP the Musashi for good measure. And I free XP past the Izumo after grinding the full upgrades for her. I just couldn't get Izumo to work for me. Congratulations my good friend ! She's definitely not a brawler, but hanging out at max range is still doing your team a disservice (I know you're not suggesting this). I was in a game with one the other day and this guy parked beside an island about 2km from where he spawned and stayed there firing at max range until he died. Of course, you're nowhere near as effective from back there. 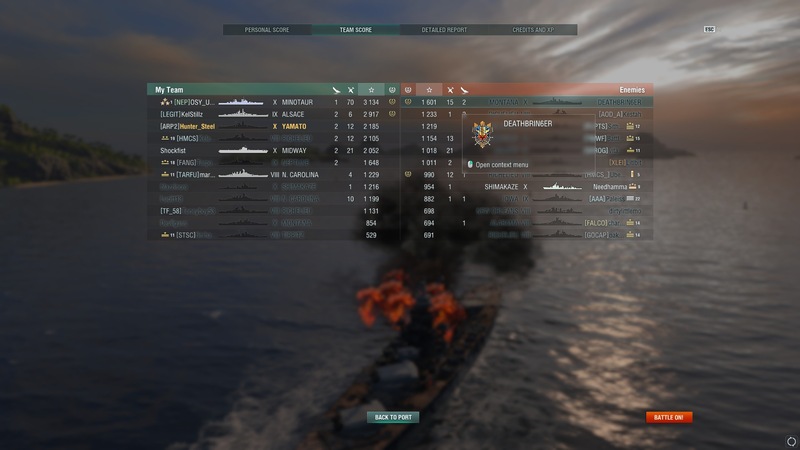 So, even though nobody shot at him until towards the end of the game when he was one of the few ships left, he was still in the bottom quarter of the team for XP. Completely off topic, but writing that up reminded me that I had a game in my Fiji yesterday that had four Rangers. I don't recall ever seeing it before, but each team had two Rangers. Ours were both AFK the entire game and we still won. The salt in chat coming from the red team was priceless. Does anyone know how much longer you will be able to get the portraits from crates? I still need quite a few more as I am not having the best of luck with getting them. Until 0.7.5 according to the front page. Ah, thanks. Don't know how I missed that. 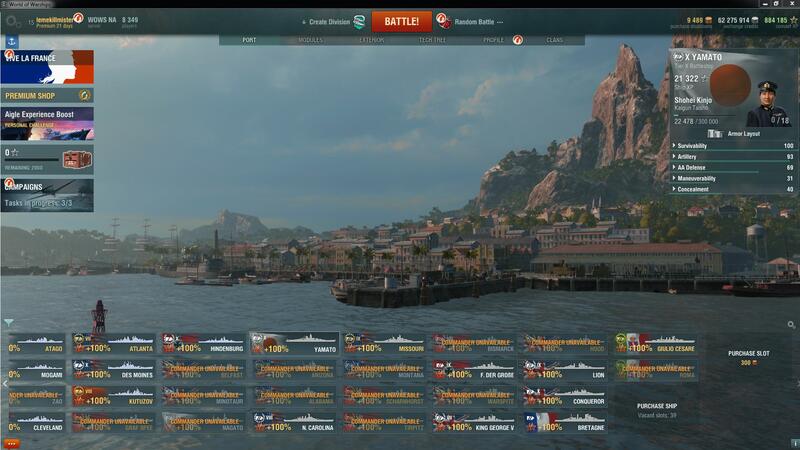 It helps having one of the HSF vessels to grind the wins with for the HSF camo. 0.7.2 gave me extra special Stealth Fleet camo - not optional. I'm at 27/35 with 21 duplicates. I don't have any HSF ships though. I'm pretty much just in this to get a T10 permanent camo. Use the Duplicates to finish the collection. 21 duplicates is only enough for four portraits. I need eight. 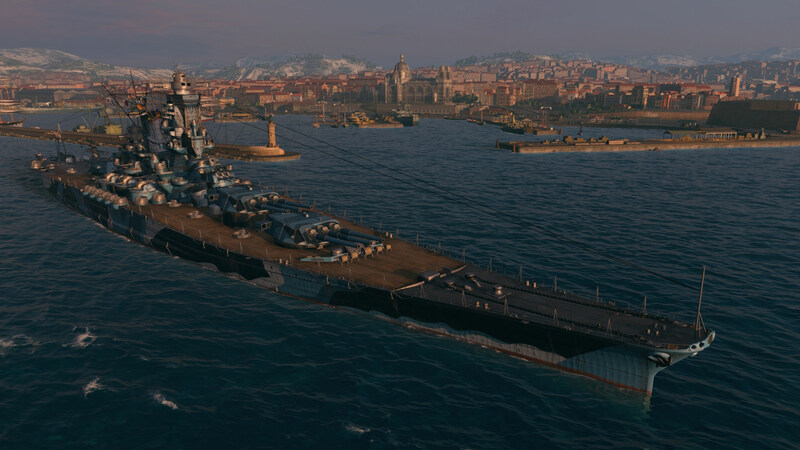 As somebody who did the painful Izumo Grind I can tell you you will need premium time )which I had thankfully been gifted some premium time), plus use your XP boosting camos and you may totally clean out your collection of XO boosting camo, you also need the XP boost flags. Don’t bother with B hull unless you are rolling in credits, go for C hull and get that one. Also forget about gun range mofuke and engine modules those are credit wasting. 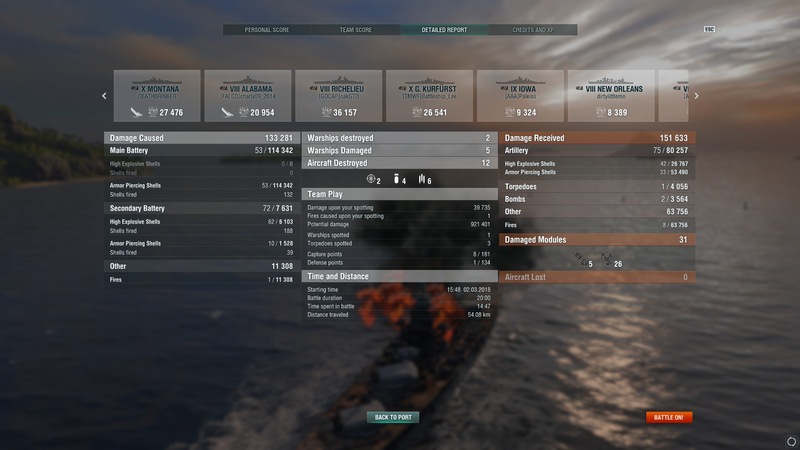 You pretty much just have to just bite the bullet and push trough Izumo and hopefully have at least some Free XP to finish the grind off in it because it is very painful grind. You also need to keep sharp eye out for when RNG trolls your AP pen, on those times or even those days you will need to use HE which thankfully will start some fire and do when’ll when AP decides to be finicky. 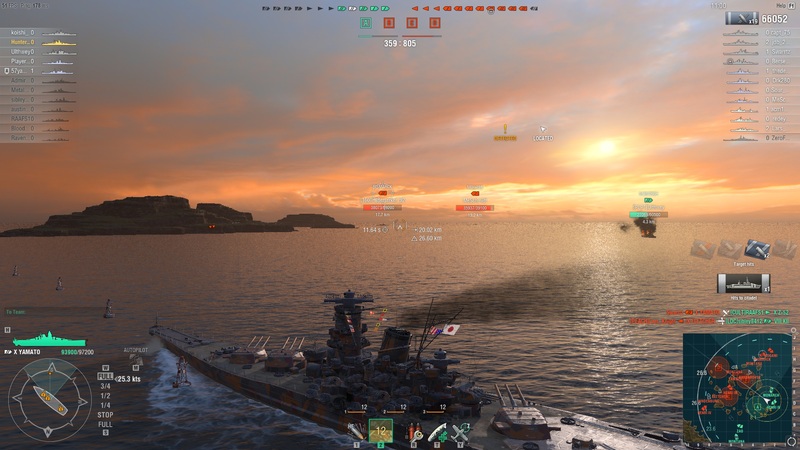 Izumo lacks the power and grace that the rest of the entire IJN lines of ships have, but when you get to the battle where you know you are watching Izumo sink beneath the waves for the last time and then after battle you get to sell it and buy Yamato you will feel so good because Yamato is excellent ship.